The United States District Court for the Northern District of Oklahoma (in case citations, N.D. Okla.) is a federal court in the Tenth Circuit (except for patent claims and claims against the U.S. government under the Tucker Act, which are appealed to the Federal Circuit). The District was established on February 16, 1925, with the transfer of a judgeship in the Eastern District to the newly established Northern district. The United States District Court for the Northern District of Oklahoma is one of three federal judicial districts in Oklahoma. Court for the District is held at Tulsa. 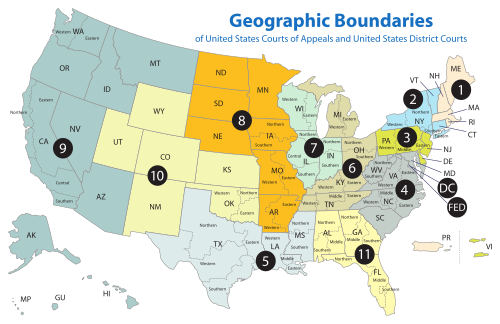 The court's jurisdiction comprises the following counties: Craig, Creek, Delaware, Mayes, Nowata, Osage, Ottawa, Pawnee, Rogers, Tulsa, and Washington. The United States Attorney's Office for the Northern District of Oklahoma represents the United States in civil and criminal litigation in the court. The current U.S. Attorney for the Northern District of Oklahoma is R. Trent Shores. 2 Alfred P. Murrah OK 1904–1975 1937–1940 — — F. Roosevelt appointment to 10th Cir. ^ Recess appointment; formally nominated on January 15, 1962, confirmed by the United States Senate on February 7, 1962, and received commission on February 17, 1962.